Having been called a fool more than once in my life, when I read the notice for this rally I immediately became interested. 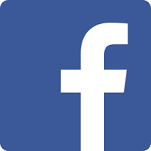 I live in Huntsville, Alabama; about 440 miles from the rally site, and I planned to ride from Huntsville to Mt. Nebo on Friday, 16 February. It rained heavily the week prior to the rally, and watching the Weather Channel, I saw that the heavy rain extended west through Arkansas. The forecast for Friday called for heavy downpours and high winds mixed with thunderstorms, and west of Memphis, falling temperatures, sleet, and snow. I packed up my 2000 Jackal and took off at 8:30 Friday morning and quickly discovered that the forecasters, for once, were right on target. The cold, windy, wet weather and limited visibility made for slower-than-normal progress. Just west of Little Rock, the rain slacked off, and my spirits brightened just before miniscule ice crystals began forming and blowing up through the bottom of my helmet into my nose and eyes and pricking the skin on my face like tiny ice picks. Well, at least it couldn't get any worse. Until I rode into the blizzard, that is, big heavy flakes of snow driven horizontally by the high winds. Visibility was near zero with, it seemed, all of the suburbanites who work in Little Rock intent on racing home in their SUVs. Although I was wet, cold, and tired, I just knew that when I arrived at the rally site, there would be a big fire to warm myself. When I reached the base of Mt. Nebo, the snow had stopped. As I rode through the very tight hairpin curves leading up to the top, I was struck by the beautiful, serene scene around me. Everything was covered with a blanket of fresh snow. Since the wind had driven the snow sideways, even the road signs and one side of the tree trunks were covered. I was the only one on the road, so I had it all to myself. When I reached the state park at the top, I discovered that I was alone there as well. Search as hard as I could, I did not find the bonfire I had fantasized. I found the park ranger. He advised me to check in with the visitors' center the next morning and called after me as I walked to my bike, "Be careful tonight, it's supposed to get down to 17 degrees." 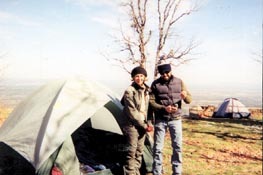 The camping area at Mt. 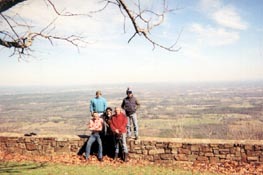 Nebo provides a magnificent view of the Arkansas River valley spread out 2000 feet below. I picked a campsite on the bluff overlooking the valley, scraped the snow away, and made several unsuccessful attempts to put up my tent in the howling wind. Some time after dark I finally had my tent set up, pad and sleeping bag rolled out, dry clothes on, and was ready to commence rally activities. After a while I heard a motorcycle begin to ascend the hill. It reached the top, and the lone rider rode through the campground and found me. This turned out to be Jim King on his 1980 SP, who had left his house in northwest Arkansas about 6:30 P.M. With both of us there we qualified as a Guzzi rally, so together we set up Jim's camp and swapped motorcycle stories. Since the county we were in is a dry one, Jim volunteered to perform rally scout duty and find the nearest establishment that could provide libation. As he rode off on his quest, I looked up and saw that the clouds had disappeared, allowing a spectacular view of the night sky through the cold, clear air. After stargazing for a while, I crawled in my sleeping bag and wondered if my cold weather gear really would keep me warm on such a cold, windy, winter's night. I'm glad to say I slept warm, even though I woke up from time to time due to the winds threatening to take my tent for a ride. Sometime later I heard Jim ride back after a successful mission to the next county. Morning dawned clear and bright. By the time Jim and I had got up and were ready to go for a ride, no one else had shown up, although Jim felt certain that, barring catastrophe, Mac and Ann Caruso, the couple who organized the rally, would be there. Sure enough, when we rode to the bottom of Mt. Nebo and started towards Dardanelle, a motorcycle with sidecar passed us on the way up. We turned around and caught Ann on the side of the road. She was experiencing engine difficulties with her California III/Sputnik sidecar outfit. We took a look, moved some wires around, and performed a couple of Guzzi incantations. 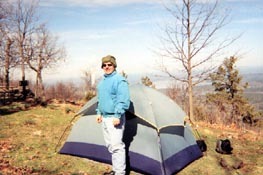 Jim and I then followed Ann up the hill to the campground in case she continued to have engine trouble. The bike ran great and, as Jim observed, "She handled that hack like a flat tracker from way back!" As the shadows began to lengthen, the five of us began to think we would be the only fools to attend this rally, but within an hour and a half, another 15 or so arrived from Fort Smith, Tulsa, Oklahoma City, and other places, riding mostly Guzzis, but also several BMWs, Yamahas, etc. Ken Hand and Peggy Tillery rode in towing a popup trailer with Ken's blue V11 EV. I must say that popup sure looked good after Friday night in my tent! The new arrivals seemed prepared for a cold night. Some took advantage of the electric hookups with small heaters and electric blankets. Now we had a full-fledged rally in progress! As riders came in and set up their campsites, old acquaintances were renewed and new friendships made. When it was time for dinner, a group of about ten rode into Russellville to Madam Wu's, a Chinese restaurant highly recommended by Mac and Ann. As far as I'm concerned, the place lived up to its billing. My dinner was delicious and the portions were very generous. Ken Hand even asked for a to-go box! By the time we arrived back at Mt. Nebo some fool had started a roaring fire (no easy accomplishment given the week of rainy weather) and as we gathered around to warm ourselves, a highlight of all good rallies began to unfold - the time of story telling and jokes, recalling favorite rides and rallies, remembering bikers who are no longer with us. This diverse group talked late into the cold night, relating experiences of rides along the coast of California, through the Canadian wilderness, touring Europe, the little-known mountains in Texas, a run to Key West, days spent riding the Blue Ridge Parkway, the Guzzi rally with the biggest bonfire in Wisconsin. We shared the common experiences of mechanical breakdowns, blown tires, and speeding tickets. The talk ebbed toward technical issues: ideas for improving performance, enlarging gas tanks, increasing fuel economy. Interspersed throughout all the motorcycle talk were discussions about a wide variety of subjects: a comparison of bow saw versus Mac's machete for tree trimming, the relative merits of different types of wood used in antique furniture reproductions, fish eye painting in Italy, dating services, home-built aircraft, owning an elephant, and some topics that are better recalled only in the memories of those who were there. Fairly late, we all heard a bike running straight pipes tearing up the hill. Speculation was pretty wild about who it was and what it was. 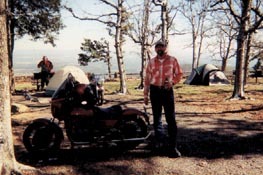 When the bike blasted into the campground, we saw it was Ken Bunch on his black and red California 1100, outfitted with large leather saddle bags, a huge plastic rear trunk, and pulling a trailer with a 10 gallon gas tank, among other things. Better late than never, and Ken jumped right in telling some tall tales. I seem to recall a story he told, about somewhere in Montana duct taping up a tire that was down to the cords, getting pulled over and talking his way out, and then making it far enough to get where he could find a new tire. Sunday morning came all too quickly, and with it the time for packing up and heading out. Thanks to Mac and Ann for putting this fine rally together. It takes a lot of behind-the-scenes work and preparation for everything to go smoothly, allowing everyone to enjoy the weekend. Good job! To all my fellow fools, I look forward to meeting again and continuing our conversations.